Forwards: The Capitals may not be the explosive team that they were in recent years (2.66 goals per game in regular season, 2.29 goals per game against the Bruins), but that doesn’t mean they are any less dangerous. Their top threat is still unquestionably Alex Ovechkin, who had 38 goals during the regular season, and added two goals and five points against the Boston Bruins in the first round. In addition to Ovechkin, the Capitals have depth up front from scorers like Alexander Semin and Nicklas Backstrom, and solid role players like Brooks Laich and Jason Chimera. On the other side, The Rangers have a nice blend of forwards, but they need to find a way to generate more offense. Marian Gaborik only recorded points in two of the seven first round games, and Brian Boyle is out with a concussion after scoring three goals in the first four games. One bright spot was the great play of Derek Stepan and Chris Kreider in the last two games of the series, as they earned key ice time with Ryan Callahan on the second line. defensemen: Dan Girardi, Ryan McDonagh, Marc Staal, and Michael Del Zotto. The top pair of McDonagh and Girardi will have the task of playing against Ovechkin’s line throughout the series, and creating a problem for the Capitals’ top guns. Offensively, it was defenseman Anton Stralman who led the Rangers in their series against Ottawa, scoring two power play goals and adding two more assists on top of having a +3 plus/minus rating. 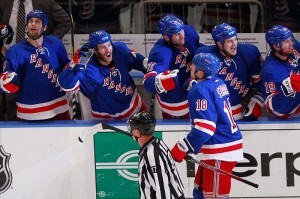 In Game 7, both of the Rangers goals were scored by defensemen (Staal and Girardi). Goaltending: For the Capitals, the question in net is whether the young phenom can build on the success he had in his first ever playoff series. After only 21 career regular season games, 22-year old Braden Holtby played in his first ever playoff series against the defending Stanley Cup Champions, and bested the reigning Vezina Trophy winner Tim Thomas in the process by carrying the Capitals to an upset win. For the Rangers, Henrik Lundqvist is the backbone of the team, and their fate in this series will most likely be determined by how well ‘The King’ does between the pipes. In Round 1, the Vezina and Hart Trophy finalist continued his great season, posting a 1.70 goals against average and a .945 save percentage in leading the Rangers to the series win. Final Analysis: Both teams are comfortable in low-scoring hockey games, and the series will be just that. The Rangers’ speed and puck possession will cause problems for the Capitals’ defense, and their outstanding defense (headlined by Girardi and McDonagh) wont allow Washington’s top guns to get room in the offensive zone, so their secondary scoring will need to solve Lundqvist in order for them to be successful. Holtby had a great series against the Bruins, but it’s tough to see the rookie get the better of the frontrunner for the Vezina Trophy. It will be a close series, but the Rangers will advance.